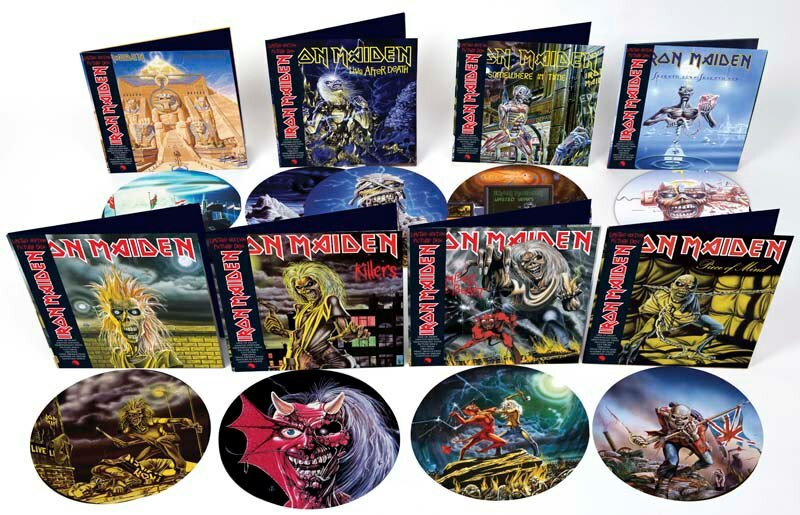 Iron Maiden have announced the launch of a series of special limited edition vinyl picture disc albums. Comprised of the first eight albums of Maiden’s career, all released in the 1980’s, each picture disc will be packaged in a gatefold sleeve with full colour printed inner bags and the heavyweight vinyl will be cut from the original album master tapes. The albums will be released chronologically between October and February, starting with “Iron Maiden” and “Killers” on October 15, followed by “The Number Of The Beast” and “Piece Of Mind” in November 2012. “Powerslave” and the double album “Live After Death” will be released in January, with the final two titles, “Somewhere In Time” and “Seventh Son Of A Seventh Son” coming out in February 2013. These vinyl picture discs are being released to commemorate the band’s current Maiden England tour which comprises largely 80’s material, in particular focusing on the “Seventh Son Of A Seventh Son” album.